If you run your own business, then taking the time to show appreciation to your staff can go a long way to building morale and encouraging team members to be enthusiastic about their work. One of the best ways to celebrate the accomplishments of your employees is to create a celebration during the holidays that is just about them. Lunch time sit down. Instead of scheduling a holiday party on a weekend or a weeknight, who not have a lunch time celebration? This will give your team members an opportunity to take a well-deserved break during the work day and not put more pressure on their already busy family schedule. Think of the timing. Having your party near Thanksgiving will help you to avoid holiday vacations. 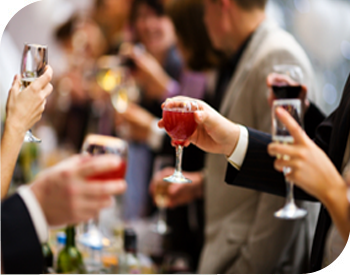 You’ll have more people attend your party and enjoy the celebration you have planned. Speaking of which, caterers can even create a Thanksgiving menu for you to serve – roasted turkey, mashed potatoes, vegetables, sweet potatoes and rolls. It’s a great way to say thank you to your team! Enjoy the New Year. Instead of jamming yet another obligation in a short period of time, think through having a New Year’s party in mid-January. Not only will employees be grateful for a pick-me-up after the holidays, but it is a great way to get people back to work. Plan for participation. If you are thinking of hosting a party, the caterer can just do the main course. If your team brings side dishes to share, it will help to build camraderie and communication. Make it about them. Many of your team members have families of their own that they care for and challenges that they must overcome in order to do the work that they do. Make sure that the focus on the event is on them. Cleveland caterers can help you to create an event that has personal, friendly service that will make every employee feel important. Your business doesn’t have to be the only place that doesn’t celebrate the holidays. Infuse a holiday spirit into your business with a Thanksgiving, lunchtime or New Year’s celebration. Your staff will be grateful and will recognize your appreciation of their efforts.